Maybe the monkey hid it? Dayton’s department store is dead, but its reputation for customer service endures: A wallet lost at the downtown Minneapolis flagship in 1965 was just returned to its owner, contents still intact. As demolition within the historic department store building progresses to make way for a new retail and office development called the Dayton’s Project, construction workers have unearthed several oddball relics including 90 antique nesting eggs, a 40-year-old box of chocolates, and, most remarkably, a mummified monkey in a seventh-floor air duct. 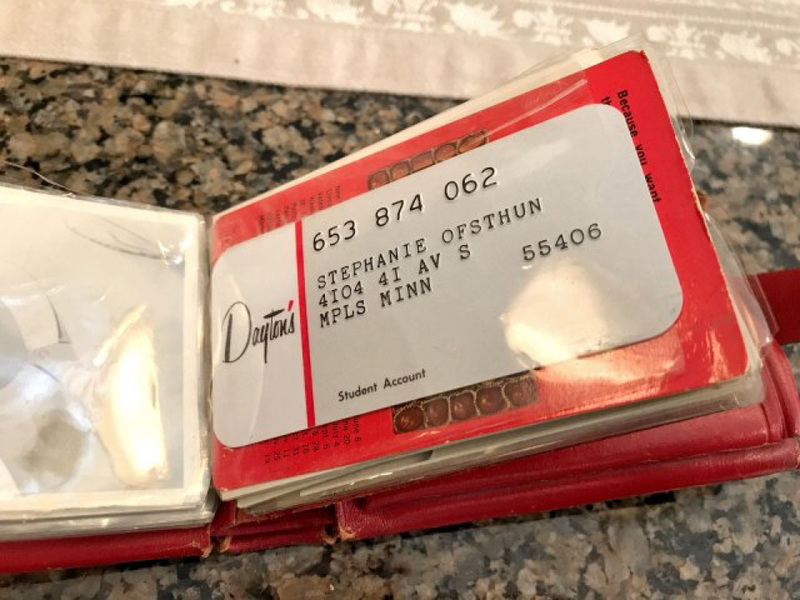 Stephanie Ofsthun’s red leather wallet must have seemed rather ordinary in comparison to the monkey carcass, which is now on display at the Science Museum of Minnesota. But a Dayton’s Project construction worker turned it over to management. Through Facebook— which came into existence some 39 years after the wallet was lost—they located its owner, a 69-year-old Minneapolis resident who goes by her married name now. Stephanie Peterson says she has only a vague memory of losing her wallet as a teenager. But she recognized it immediately—so thick with photos of classmates, the fold-over wouldn’t properly latch. But it was in fine condition other than a small tear on the cover. The wallet is a time capsule of Peterson’s Minneapolis youth. 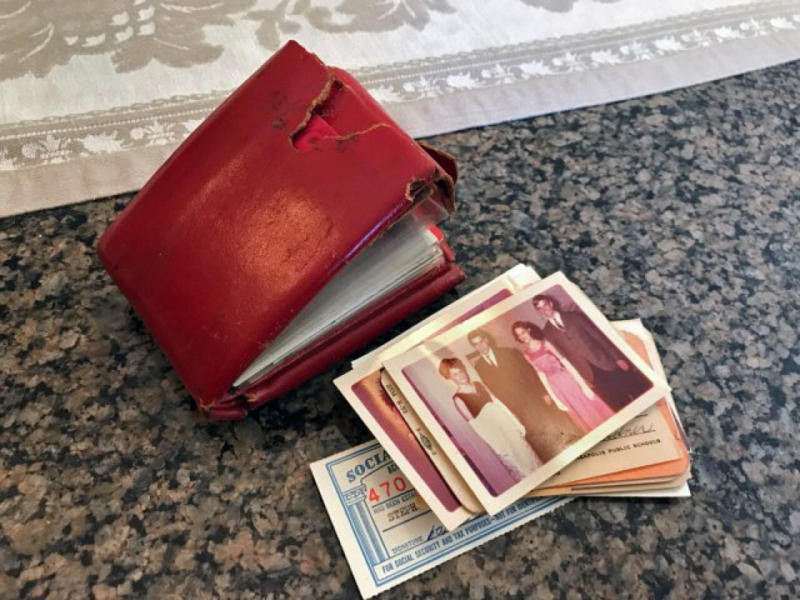 In it, she found her school locker combination, swimming certificate, YWCA card, scraps of notes and photos from friends, a black and white Dayton’s charge card, and her Social Security card, which she says she hasn’t once needed in the five decades since she lost it. “I knew the number by heart,” she says. Peterson would have been 17 at the time the wallet disappeared. A student at Roosevelt High School in Minneapolis, she spent a lot of time at Dayton’s as a member of the store’s teen board, and a sales associate in the juniors’ department. Peterson’s connection to the hometown department store continued into the 1970s when she was a media buyer for Grey Advertising and worked with Dayton’s creative department—including legendary marketing guru John Pellegrene— on radio and TV spots. She went on to become associate publisher of Mpls.St.Paul, and that job title in her Facebook profile led the Dayton’s Project team to the magazine, which provided the direct link to Peterson. “It was really a kick going through it,” Peterson says of her old wallet. Construction crews are working around the clock on the Dayton’s Project with the goal of opening in September 2019. The only confirmed amenity is a food hall curated by Andrew Zimmern.